Why Rent Commercial Diving Equipment? Bay-Tech Rentals’ wide variety of commercial diving equipment will have you covered in every aspect of your job. There are many benefits to renting equipment over buying equipment. Renting allows you to do temporary or seasonal work without the full expense of buying new equipment. 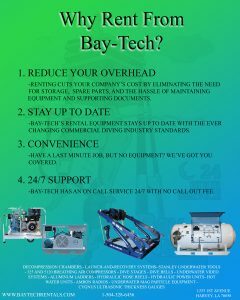 Bay-Tech has a full line of rental equipment ready for you call. There is always a member of our team on call 24-7 ready for your call. See What Bay-Tech Rentals Has To Offer!